Lots of interesting news from our blog friends this weekend…we’ll just rely on short pointers. The folks at HealthLawProf Blog point to the Kaiser Family Foundation’s bimonthly report on public opinions on health care. The current report finds that health care costs top the list of Americans’ concerns and outpace concerns about quality and access of care. 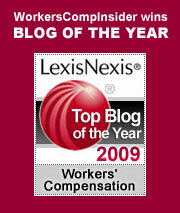 Workplace injuries and illnesses in 2003. This is part 3 in a scontinuing series of reports from BLS. Thanks to LaborProf blog for the pointer. Joe Paduda at Managed Care Matters reports on the workers compensation liability implications of the Celebrex and Vioxx fiascoes. Ronald Ryan responds to a query about Michigan benefits available for a work-related death. It’s nice to see that Judge Robert Vonda has retuned to the blogging scene. Thanks to rawblogXport for the pointer. Michael Fitzgibbon, our neighbor in the North conistently who runs a fine blog, reports on shift work and overtime as a health and safety issue. Confined Space runs through The Weekly Toll which should be required reading every Monday for all of us who work in the insurance industry so we remember what this business is really all about. This entry was posted on Monday, December 20th, 2004 at 1:00 am	and is filed under Misc., News roundups, Social media. You can follow any responses to this entry through the RSS 2.0 feed. Both comments and pings are currently closed.